Winkelmatten chapel or Zur Heiligen Familie is absolute gem located at the end of the village in the Winkelmatten quarter. Built in 1607, this beautiful chapel is a smaller scale copy of the old village church. The showpiece of the chapel is the baroque altar, carved from Swiss stone pine in 1730 and the Holy Family stands in the center of the retable. This beautiful chapel is popular place to get married and also one of the popular photograph area. 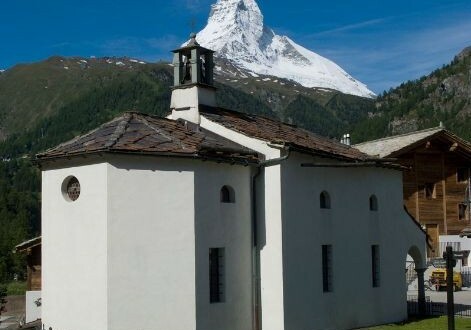 The cute and gorgeous white chapel is popular for photograph not only of the beauty of the chapel but also because the magnificent Matterhorn can be seen in the background. Matterhorn glacier paradise is the highest cable car station in Europe at the height of 3883 meters. The view is absolutely breathtaking with the views of the highest mountain in Italy, France and Switzerland. Up here, right by the Italian border, visitors can see different sides of the Matterhorn. The view is very different to the one from the Gornergrat or the Rothorn, it is as if the Matterhorn has acquired a new look. 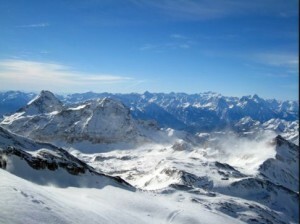 The vantage point offers the finest view of the mountain’s south face and it is the best and popular place to take the photograph of the unique faces of the Matterhorn. The observation platform has a summit cross and mountain panorama for photographers to take a wonderful photograph. For photographers and people who wants to take a beautiful and magnificent photos of the alpine mountains, this is the one of the best spot. Photopoint views from mountain huts is another popular places to take photographs. Mountain refuges in the Alps have added an attraction alongside accommodation, they offer the chance to take dramatic photographs of the mountain scenery at any time of day or night. At twilight the colors are especially rich and beautiful. Every keen photographer dreams of shooting the ultimate picture of the mountain landscape complete with the drama of sunset and twilight. At mountain huts, guests can take spectacular photos at any hour of the day or night in comfort without having to camp out. 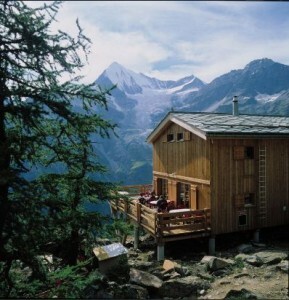 At Dom hut, the views are absolutely spectacular with many 4000 meter peaks in view. Europa hut at the junction of the Europaweg trail and the path up to the Dom hut has a vast mountain panorama that also incorporates trees. This is one of the best photograph location close to the treeline and many photographers come to take a shot of the breathtaking view.